If you love the whole shabby chic Christmas look, I’ve got a ton of tips to help you recreate it at home. The best part? It’s totally doable on a tight budget. After all, that’s kind of the original point of the shabby chic decorating trend, right? I love going all out with Christmas decorations, but this year money is just way too tight. Everything “extra” I have is going towards gifts for my son. I don’t have anything left over to buy new decorations. Not even cheap plastic garland (which is just insanely expensive for what it is). So, I am just making do with what I have, and making a few little decorations out of stuff I already have on hand. I know that some of you are in the same boat, while others have a little extra wiggle room in their budgets but just prefer the shabby chic Christmas look. I’m trying to include ideas that work for both! We’ll start with the mantle, then move on throughout the house. *This post features affiliate links. If you make a purchase through these links, I earn a small commission at no extra charge to you. Thanks! I don’t have a lot of free surface areas in my house to fill up with decorations, but I do have a mantle! This is the focus point of my holiday decor (aside from my tree), so I try to make it as cute as possible. The following tips will help you decorate your Christmas mantle in the shabby chic theme. If you have pictures on your mantle, and many people do, you don’t have to take them down just because it is Christmas. Instead, keep the pictures up, but switch out the frames. Even if you already have shabby chic-friendly frames, now is a great time to put away the white frames and bring out some distressed wood ones. This really adds a fun look to your mantle where the rest of your shabby chic Christmas décor is probably white, silver, and pastel colors. It gives some nature to your mantle without getting too far from the shabby chic look you want to acquire. For a bit of fun, you can even switch out the pictures and replace them with pictures of angels, snowmen, Santa and Mrs. Clause, as if they were friends and family members. 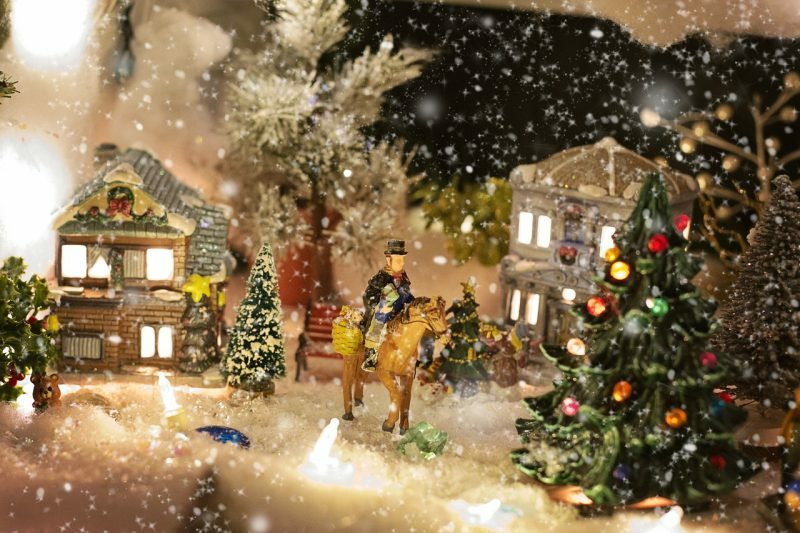 Many people create a Christmas village and put it on a table, but why not put it right on your mantle? It keeps it high enough to be away from kids or cats who are a little too curious, as well as being in a room where your family probably spends a lot of time during the holidays. Not only that, it is a convenient place to spread around twinkle lights and p lug them in, allowing you to easily illuminate your shabby chic-style Christmas village. Check out more tips on how to create a cute Victorian-Style village below! 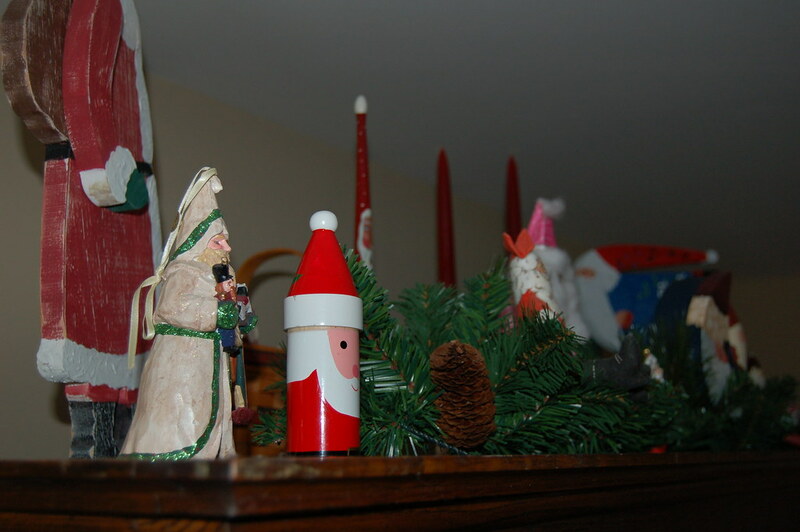 For more traditional decorating of the mantle, you might want to use various decorative accessories and figurines. For a shabby chic look, try to find items that are vintage or at least have that old-fashioned look to them. that have old-timey clothes instead of the bright red coat and hat of the more modern styles. Bottle brush trees are really popular during Christmas since they are inexpensive and always add a fun element. However, instead of the bold green ones, you can either get them in white and other pastel colors, or spray paint them yourself. Spread them around your mantle in between other decorative items. Many Christmas villages use old-fashioned houses and buildings, but they are often made with red brick woods, yellow shutters on the windows, or other colorful accents. While they make for a beautiful and bright village, they aren’t the best options for a truly shabby chic Christmas village. 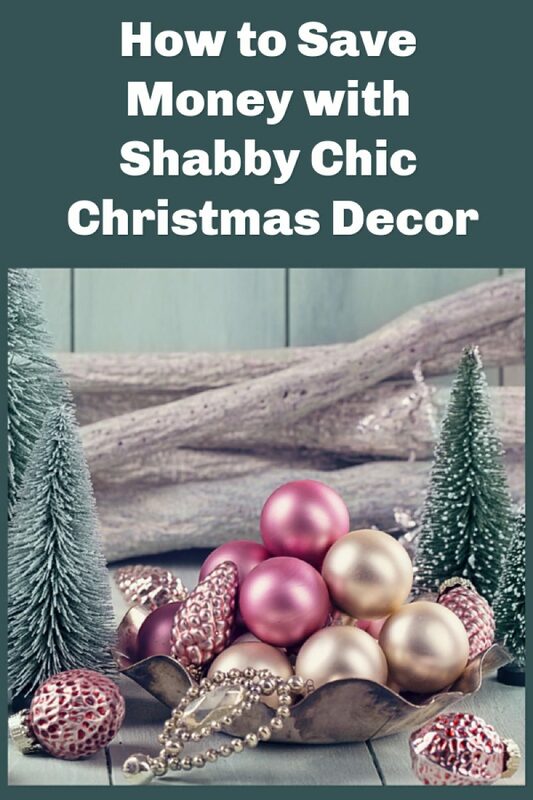 Instead, consider using all white or pastel-colored houses and buildings to match the rest of your shabby chic Christmas décor. The overall style of the houses as well as the color scheme also make them fit more of a shabby chic style. Shabby chic and Victorian styles are often closely matched, so try to find small cottages for your village with an old Victorian look. Things like pointed roofs, bay windows, and brick roofs are good options for this particular style. The people you choose to place around the Christmas village can also represent your desired shabby chic style. Luckily, the majority of figures that are sold with other Christmas village stuff already have the old-fashioned clothing style you are probably looking for. However, do pay attention to what they are wearing so they fit in well with your shabby chic style. For villages, a combination of young and older adults, elderly, children and babies, and pets are good to have a full community. is essential to any type of Christmas village, but especially one meant to have a shabby chic look. Shabby chic has a lot of white in most of its décor, so by adding more snow around your village, you really allow it to have that natural shabby chic look. Add snow on the ground, cover trees and rooftops with it, and sprinkle it around so little bits of snow look to be dropping on the figures and other decorative elements. For your holiday table, you should begin decorating by adding some centerpieces. This might be one long centerpiece or multiple decorations for the middle of a larger dining room table. These centerpiece ideas are for both shabby chic and Christmas styles. This is one of the simplest and least expensive décor items for your table centerpiece. 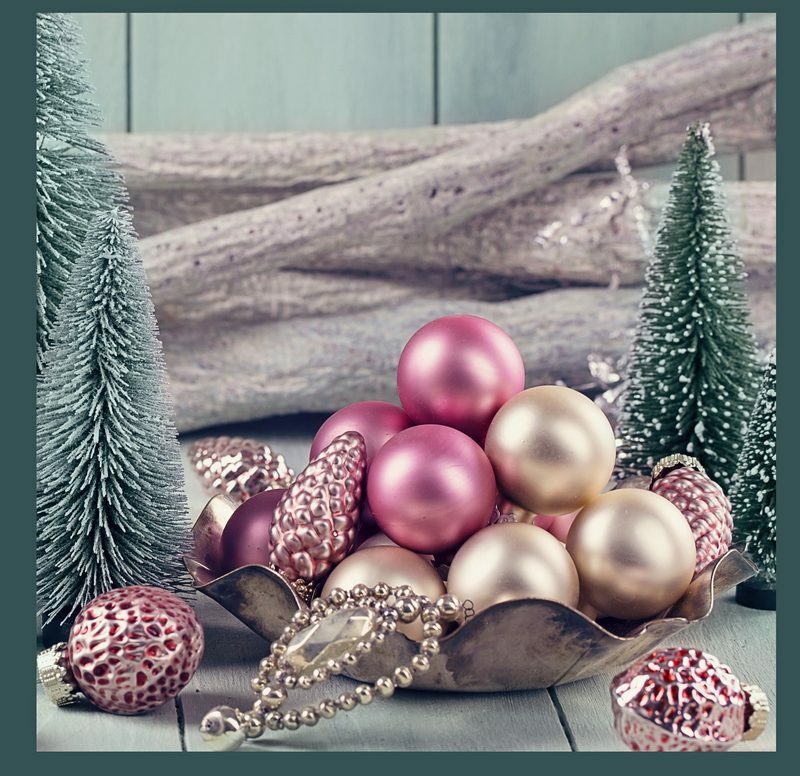 It works with any style of Christmas décor, so for shabby chic, you are just changing the overall style and color of the bowl and what goes inside of it. If you can find an old wooden bowl, that is perfect for this. You can also use any white or silver bowl you have. Fill it with pinecones spray painted white or another shabby chic color like light green or pastel pink. You can also just fill it with ornaments of these same colors. Ball ornaments in white or silver often work very well for this type of centerpiece. 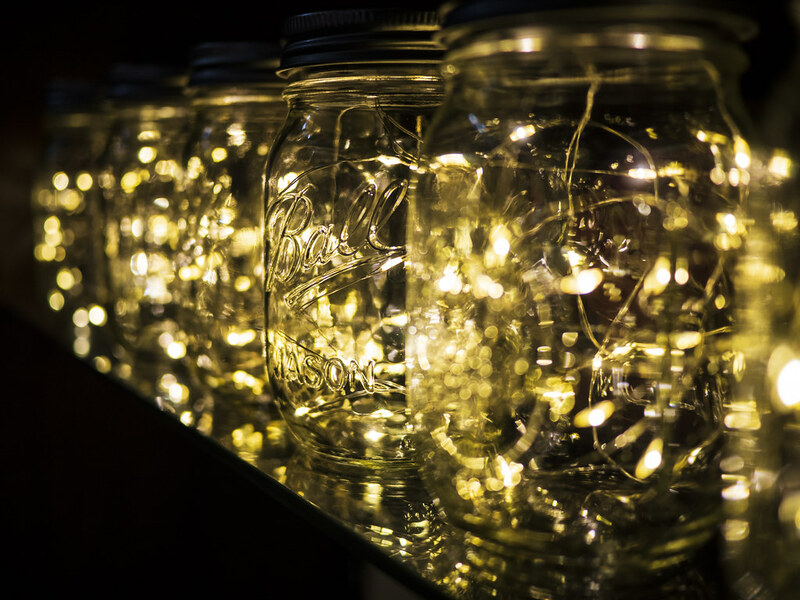 You can either get shorter strings that use batteries for the lights instead of being plugged in, or you can drill holes in the bottom so that you can pull out the lights and plug them in somewhere near the table. Just bring the cord underneath the table runner so it isn’t obvious, then connect them to a nearby outlet.
. There are clear cake platters, or you might even find one in a distressed white color or silver. Just add some snow to the platter, then add some houses, buildings, and people, and your village is ready for Christmas. and spray paint it a white color, then add some distressing elements. You can also use an older wooden planter for this purpose. Decorating your front door for Christmas is easy when you go with a wreath, but if you want to stick with your home’s shabby chic style, then there are a few things you should do first. The following ideas allow you to have a festive holiday wreath that contains the vintage, feminine charm of a shabby chic home. Instagram is a great source for inspiration here! A very popular decorative element for any Victorian, old-fashioned or shabby chic Christmas style is to use old ice skates. The ones you get might not actually be vintage, but you can usually find old skates at thrift stores or secondhand stores. If not, check stores with Christmas decorations, and you might find imitation skates that work good for this type of wreath. There are a few different ways to do this. You can go with a traditional wood wreath that is heavy enough to support the skates hanging in front of the wreath, or go with something else entirely. For example, you can get a small, old window frame that you can hang as a wreath on your door. Hang the skates in front of the window frame and it really creates a vintage, shabby chic-style design on your front door. You can also go more basic with your wreath by starting with a foam wreath and covering it in any fabric that is white, silver, light blue, light green, or light pink around it. You can leave it solid with just a bow or an angle attached, or add some other elements like pearls, lace, or a few old ornaments. Another option is to wrap pink or white straw garland around the wreath form, then attach silver ball ornaments around it. This is a really easy way to show visitors you are decorating your home in a shabby chic Christmas style. Part of the shabby chic style is having wood in a lighter color that looks distressed as if it is genuinely vintage furniture. You can incorporate this in your wreath by first covering the wreath form in the desired material, then gluing on wood ornaments. Use all ornaments that look to be distressed or vintage in a Victorian style. You can try to cover the wreath entirely with ornaments, just scatter a few, or have one large ornament near the center and some smaller ones off to the side. It is easy to create a wreath with any type of shabby chic materials or ornaments by sticking to the right color scheme. These are just a few creative ways to have a shabby chic Christmas! I hope you enjoyed them! I love so many of the different decorating designs. What get’s me is the old-fashioned Victorian village. It’s so beautiful and reminds me of older times and happiness that comes by simpler things and times. I am going to try some of these ideas to create my own. I love all these ideas and cost effective, too! Just a few days left for the Christmas. I’m just looking for home decorating idea and your post really help me to find some amazing home decorating idea for Christmas. I love the VICTORIAN-STYLE CHRISTMAS VILLAGE concept! It is traditional, but could go with any decor!